● Use for T-REX 700. ● Brand new matting carbon tailboom using carbon fiber and aluminum imbedded technology, features light weight and high strength, its unique matting carbon color coupled with whole helicopter, definitely let your helicopter outstanding in the flying field. ● Must with H7NT004XXW 700N DFC Torque Tube. 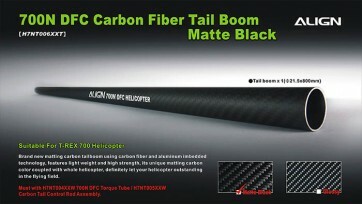 ● Must withH7NT005XXW Carbon Tail Control Rod Assembly.